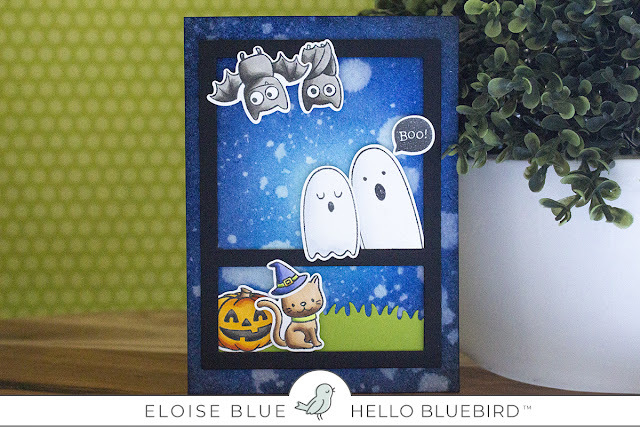 Hi friends, I have a card for Hello Bluebird today using the Halloween Fun stamp set. I also pulled in the Grassy Knoll Dies as well as the Gallery Frame #2 Dies to help set the scene. To start off, I stamped out all my images onto some white cardstock and coloured them in with Copic Markers. 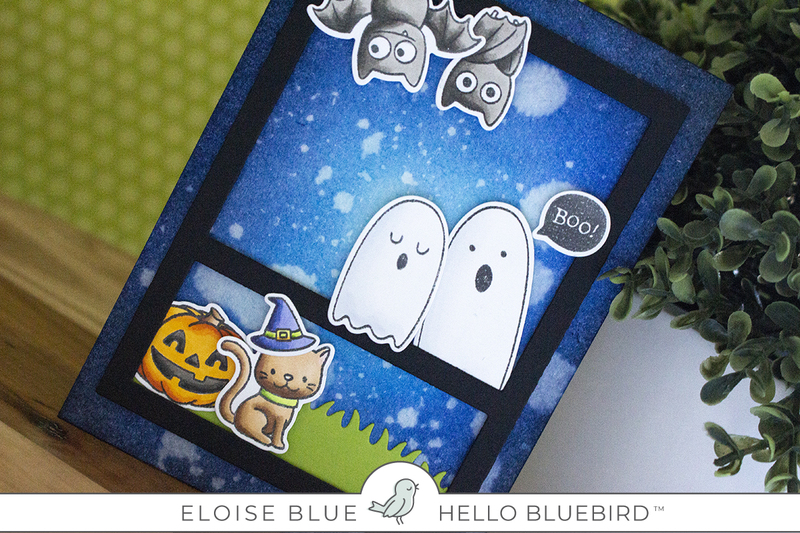 I then cut them out using the coordinating dies. I set them off to the side and while I had my die cutting machine out, I die cut the frame from Gallery Frame #2 out of some black cardstock and also the Grassy Knoll Dies from some green cardstock. I set them all off to the side and worked on my background. For my background I used some Distress Inks. I pulled in Tumbled Glass, Salty Ocean, Blueprint Sketch, Chipped Sapphire and Black Soot and worked in a circular motion from the centre of the cardstock. I then flicked some water onto the background. I picked it up with some paper towel and dried the background with a heat tool. I then added foam tape onto the back of everything and adhered it into place. For the sentiment, I had stamped 'Boo' from the same Halloween Fun stamp set so I adhered that for my sentiment. Thanks so much for stopping by today, I hope you enjoyed and got inspired.